We participated in the Variety Fair exhibition and shop again this year, Christina made two Jam Fancy outfit sets and Paul and I worked on the doll to model one of the outfits. We were sent a lovely butter-yellow haired girl to work on (I wonder how many of these they have at the factory… the hair is gorgeous!). Christina finished the outfits before we got started on the makeup. 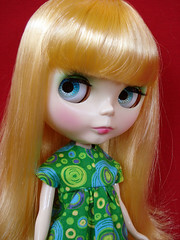 She used the Blythealizer to come up with a makeup combo that worked with the outfit, She came with normal skintone and primadolly-esque makeup. 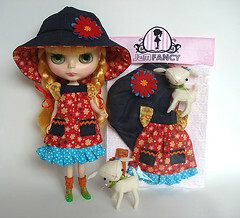 We decided that she should have fairer skin, so my Primadolly Aubrey got the swap. They are both happier in their new skin as my Aubrey always looked a little ill to me. Anyway, this time we tried an all-airbrush makeup including shaded lips. It was our first try and we are happy with the results, and will continue to refine the technique. The finished girl has pink lips with red shading on the bottom. We created our own mask for the shape and sprayed it in two stages. Three of her eyechips have been airbrushed for depth. This technique is super easy and gives the eyes so much pop! Of course, she has three sets of P-chips. With Paul airbrushing the lips, you may be wondering what the heck I did… This time, I did the eyeshadow! We kept it simple, one color, a teal green to match her dress. I sealed the lids with high gloss to prevent scratching and give her a dewy look. Where/when was/is the Variety Fair? Sounds like a fun time! I had no idea the lips were airbrushed, shows what a brilliant job you have always done on them Melissa. The eyeshadow is superb too, wish I lived near by and you two could take me on as an apprentice. i can’t say enough good things about her eyes and make up 🙂 wow! I got the free patters from your website thanks! Also, you might want to check on the links to the patters and thumbnails because some of them do not coincide.